Nicholas Rednour & Jacob Milligan. 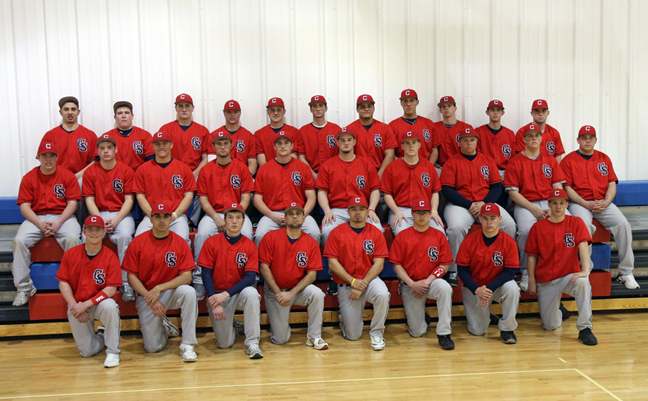 Middle Row (L to R): Jeremy Ellsworth, Ethan Wagler, Blaine Robinson, Michael Milan, Adam Terbeek, Nick Guinn, Jim Granack, Ryan Bumphrey, Nathan Dennison & Head Coach T.J. Lindburg. Back Row (L to R): Rogue Schott, B.J. Billings, Caleb Weaver, Nick Leary, Coty Connor, Brian Evans, Tony Valdes, Ethan Morris, Zak Engelbrect, Zach Stortzum & Brad Custer. 1 Joe Shepherd OF Soph. ROWVA Rio, Ill.
2 Brian Evans UT/P Soph. Clinton Clinton, Ill.
3 Blaine Robinson C/DH Fresh. Monmouth-Roseville Monmouth, Ill.
5 Jeremy Ellsworth C/DH Fresh. North Fulton Cuba, Ill.
6 Brad Custer OF Soph. Waubonsie Valley Naperville, Ill.
8 Jacob Milligan 2B/SS/P Fresh. Galesburg Galesburg, Ill.
9 Julio Riojas C/UT Soph. United Township East Moline, Ill.
10 Jim Granack P Fresh. United Township East Moline, Ill.
11 Ethan Wagler P Fresh. Farmington Farmington, Ill.
12 Michael Milan C Fresh. Abingdon Abingdon, Ill.
13 Nick Leary 3B Fresh. Monmouth-Roseville Monmouth, Ill.
14 Ryan Yoho UT/P Fresh. Abingdon Abingdon, Ill.
15 Coty Connour OF Fresh. Knoxville Knoxville, Ill.
17 Justin Main OF Fresh. Galesburg Galesburg, Ill.
18 Sam Decker UT Fresh. Alexis Alexis, Ill.
19 Nicholas Rednour OF Fresh. Kewanee Kewanee, Ill.
20 Adam Terbeek OF Fresh. Knoxville Knoxville, Ill.
21 Ethan Morris P Soph. Clinton Clinton, Ill.
23 Tony Valdes 1B Soph. Dixon Dixon, Ill.
24 Nathan Dennison C/DH Fresh. Kewanee Kewanee, Ill.
25 Caleb Weaver SS/OF/P Fresh. Galesburg Galesburg, Ill.
26 Alex Lozano C/OF Fresh. Galesburg Galesburg, Ill.
27 Zak Engelbrecht P Fresh. Alden-Hebron Hebron, Ill.
28 Ryan Bumphrey P Fresh. Kewanee Wethersfield Kewanee, Ill.
30 Rogue Schott P/1B Fresh. Galesburg Galesburg, Ill.
33 Zach Stortzum P Fresh. Decatur Christian Decatur, Ill.
37 Nick Guinn P Fresh. Riverdale Cordova, Ill.